Ms. Ellen Ambrose, 85 of Berea, died Tuesday, October 2, 2018 at Baptist Health Hospital in Lexington. She was born in Rockcastle County, KY on May 21, 1933 the daughter of Robert and Clesta Mae Croucher Ambrose. 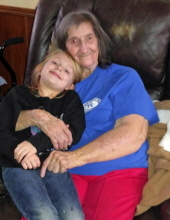 She was a farmer and homemaker and was a member of Fairview Baptist Church. She is survived by several nieces and nephews including, special niece Gail Coffey Baker and husband Danny; and special great nephew, Ray Anglin and wife Erica and their children, Nevaeh and Kylie; as well as a host of other relatives and friends. In addition to her parents, she was preceded in death by four brothers, Carlos, William, Wayne, and Donald Ambrose; and four sisters, Bessie Mae Ambrose Barga, Eva “Evie” Marie Ambrose, Thursie Belle Ambrose, and Mary Berniece Ambrose Coffey. To plant a tree in memory of Ellen Ambrose, please visit our Tribute Store. "Email Address" would like to share the life celebration of Ellen Ambrose. Click on the "link" to go to share a favorite memory or leave a condolence message for the family.